“I am particularly excited to announce our new SMS offering which places text-to-9-1-1 capability inside our VESTA 9-1-1 solution, giving agencies the ability to easily address text calls. This is what our customers have been asking for,” said Freinberg. The company introduced multiple new products and upgrades within its suite of VESTAâ 9-1-1 solutions. The release includes the launch of the VESTA® SMS solution, the company’s text-to-9-1-1 platform, an entirely new VESTA Map solution, and significant upgrades to the VESTA Analytics solution. Each delivers leading edge technology to strengthen and advance public safety communications for communities of all sizes. Freinberg said Airbus DS Communications has been in business for over 40 years, providing public safety answering points (PSAPS), which allows people to call 911 and state their emergency. “Today in the U.S. marketplace, we serve over 60% of the 911 calls that come into over 6,000 centers in the U.S. Our system accepts that call,” said Freinberg. “We’ve done this over the years through acquisition as well as organic growth. The public safety answering points (PSAPS) are police, sheriff’s offices, fire, emergency management, airports, they are on federal Department of Defense bases, Army, Air Force, Navy, NASA. Consequently they are on U.S. property. Airbus also has solutions on properties located outside the U.S. where they embrace U.S. standards. This platform, VESTA 911, can operate in multiple languages. It is there to handle those calls as they come in. The largest cities would be New York City, Los Angeles, and Chicago. The VESTA SMS solution is based on the NENA i3 specification and supports interfacing Text Control Center (TCC) service providers as outlined in the Joint Alliance for Telecommunications Industry Solutions (ATIS) and the Telecommunications Industry Association (TIA) J-STD-110 specification. 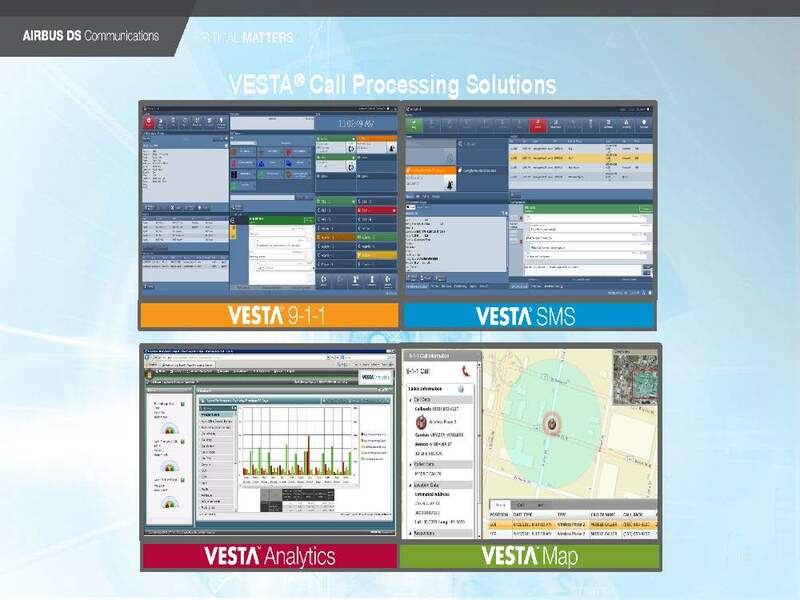 VESTA and the entire suite are moving to build geospatial multimedia call handling and routing calls within the customer enterprise. The technology allows the building of systems large enough that 1-5-50 public safety answering points (PSAPS) can share one VESTA system – a VESTA instance. Those PSAPS can now share information because they act as one VESTA instance. They can share their GIS mapping data, they can use same set of data, they can receive calls, they can have an operator go from one PSAP to another. They can pick up their calls at that answering point in case the first one goes down. Now that Airbus DS is building multimedia based call handling and routing solutions in larger regions and sharing that, GIS data becomes more important for routing based on coordinates x,y and z. SMS is considered a “major initiative” and Airbus’ goal is to get the vast majority of VESTA 911 customers handling SMS. The new VESTA 911 capability within the VESTA 911 platform can be likened to being able to see text messages on the phone and respond back. That window on the iPhone is sitting in front of a telecommunicator – the operator picks it up clicks up on the screen, up comes request for service and the session begins. That session is also on VESTA Map and pops up. Depending upon the cellular carrier it would give you the GIS coordinate or nearest tower to that location and the text session continues. SMS is a best effort service so the text could go back and forth – in some cases text is instantaneous, or could take 30 seconds to 1 minute. The VESTA Map solution is entirely new and offers users a real-time mapping built on Esri’s ArcGIS for Server. The solution can support regional or statewide 9-1-1 systems via an Emergency Services IP Network (ESInet) so public safety providers can share resources and save costs. The PSAPS are now sharing these large VESTA systems, across 5-30 PSAPS. This has been the sweet spot in the market for Airbus DS where their systems share very hardened core back rooms that can serve 200+ plus and can consume 300+ call takers. Municipalities can acquire the Airbus DS platform or rely on their service providers who resell and they sell it as a prime contractor. These providers may be Century Link, AT&T or others who sell as prime contractor and install VESTA systems. VESTA systems are supported at a second and third level, they have their technicians onsite and support the system remotely or onsite. “We have 200 PSAPS directly ourselves without a service provider but most are operating through them,” said Freinberg. Today PSAPS are associated with street addresses. Five or ten years from now, they will be routed geospatially with coordinates and data. VESTA Map and Analytics are the first step toward that. “From handheld device to right location with the right data with it. The transformation is the first step in that direction with our suite,” said Freinberg. This entry was posted on Thursday, July 16th, 2015 at 3:24 pm. You can follow any responses to this entry through the RSS 2.0 feed. You can leave a response, or trackback from your own site.